All Turnouts being traded under the program must be washed. The condition of the turnout is at the discretion of the retailer. The consumer must complete the trade in certificate for the retailer to qualify for the allowance on offer. On receipt of the trade certificates, Horseware reserves the right to contact the consumer, directly, for validation purposes. To participate in the program, complete and sign the form where indicated or register online by 9/16/2013. Return the trade in certificates to Horseware by 12/10/2013, with proof of purchase of the new turnout, to qualify for the appropriate credit. Trade in allowance is offered in accordance with above instructions during the trade period 10/01/2013 - 11/26/2013. The net advertised price on the Rambo Turnout must carry the details of the offer. At the end of the promotional period, Horseware will issue a credit to the retailer in accordance with the quantity of correctly completed trade in certificates, up to a maximum of those invoiced to the retailer between 07/01/2013 and 11/30/2013. A credit of $25.00 per correctly completed trade in certificate will be issued to the retailer at the end of the promotional period. Participating retailers (once signed up) will be registered on the Horseware website. Retailer must promote the Big Rambo Trade In 2013 program campaign through online and social media activity at least three times during the campaign period, 10/1/2013 - 11/26/2013. The Rambo Trade In discount should not be offered in conjunction with any other promotions or discount. Discontinued and closeout turnouts are not eligible for Rambo Trade In promotion. Fill out the voucher form below. Mail it with your cleaned used blanket to trade in. 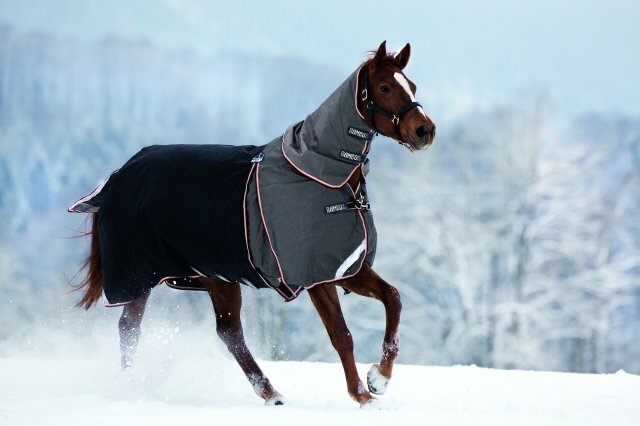 We'll donate your trade-in blanket to the Dreamcatchers Equine Rescue where their furry friends in need will be very thankful! You'll receive a refund of $50 toward any new 2013 Rambo Turnout. 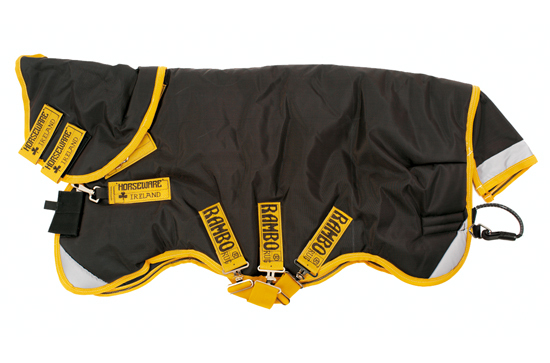 We hope you and your horse enjoy your Rambo turnout for years to come.